The first stage of the accounting information system development is the analysis of the organization, for which the system is created. It is necessary to build a model that describes the workflow and data flow processes in the organization. The model should contain all the necessary information about business processes, functions, and features of the organization. DFD (Data Flow Diagram) is the most frequently used type of flowchart that is used for structural analysis and design of accounting information systems. The main objective of the Accounting information system DFD is to show how various activities convert their inputs into outputs and identify the relationship between activities. The flowchart symbols Yourdon and Gane-Sarson notations are used to create the DFD diagrams for accounting information systems. Data Flow model is a hierarchical model. Each process can be divided into structural components, that depict by corresponding flowchart symbols, showing the accounting information system in communication with the external environment. The major components of the accounting information systems flowchart are entities, processes, data stores, and data flows. The set of standard symbols is used to depict how these components interact in a system. ConceptDraw DIAGRAM allows you to create an accounting information system flowchart using special libraries, supplied with Data Flow Diagrams Solution. 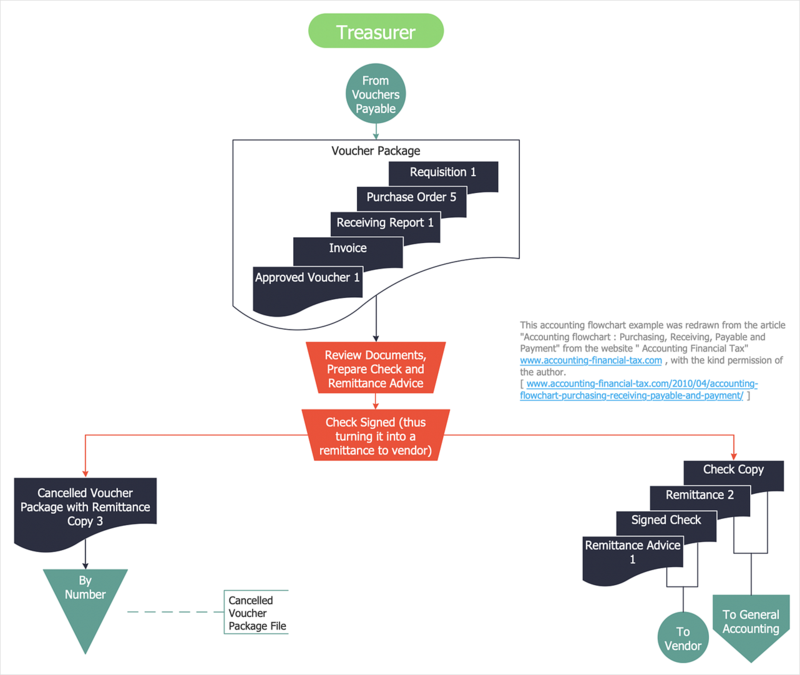 Run ConceptDraw DIAGRAM and open libraries containing symbols that can be used for the accounting information system flowchart. After building a complete accounting information system flowchart it should be detailed and documented. You can export your flowchart to MS PowrPoint, or Adobe PDF using the Export capabilities of ConceptDraw DIAGRAM. Result: Accounting information systems flowchart symbols are used to depict a data flow in the accounting information system during accounting systems modeling and data processing analysis.